The school year is off to a roaring start, and this is the year that I figure out how to teach problem solving strategies (and continue making students show their problem solving strategies). Problem solving strategies are pivotal to word problems. In word problems, there are so many words that need decoding, extra information, and opportunities for students to solve for something that the question is not asking for. C.U.B.E.S stands for circle the important numbers, underline the question, box the words that are keywords, eliminate extra information, and solve by showing work. Why I don’t like it: With all of the annotating of the problem, I’m not sure that students are actually reading the problem. None of the steps emphasize reading the problem but maybe that is a given. R.U.N.S stands for read the problem, underline the question, name the problem type, and write a strategy sentence. Why I like it: Students are forced to think about what type of problem it is (factoring, division, etc) and then come up with a plan to solve it using a strategy sentence. This is a great strategy to teach when you are tackling various types of problems. 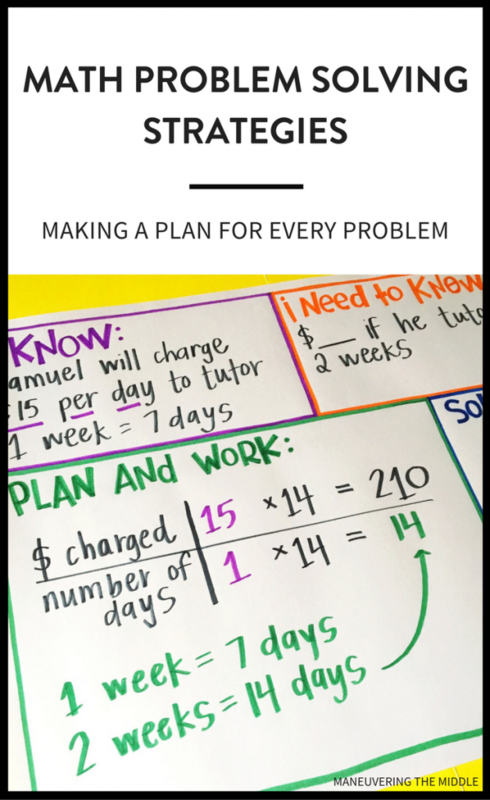 Why I don’t like it: Though I love the opportunity for students to write in math, writing a strategy statement for every problem can eat up a lot of time. U.P.S. Check stands for understand, plan, solve, and check. Why I like it: I love that there is a check step in this strategy. Students having to defend the reasonableness of their answer is essential for students’ number sense. Why I don’t like it: It can be a little vague and doesn’t give concrete “what to dos.” Checking that students completed the “understand” step can be hard to see. Here is the strategy that I am adopting this year. It doesn’t have a name yet, or an acronym, (so can it even be considered a strategy…?) but I will have the steps on an anchor chart in my room. See below. I Know: This will help students find the important information. I Need to Know: This will force students to reread the question and write down what they are trying to solve for. Plan and Work: Here is where students take their knows/need to knows and get to work. My Solution: This is where students will ask themselves if the answer is reasonable and whether it answered the question. Here is where I typically struggle with problem solving strategies: 1) modeling the strategy in my own teaching weeks after I have taught students to use the strategy and 2) enforcing students to do it. So…basically everything. This might be why I haven’t been able to stick with a strategy from year to year. Students who plan succeed at a higher rate than students who do not plan. Do you have a go to problem solving strategies that you teach your students? Any ideas on what I should name my new strategy? As a reading specialist, I love your strategy. It’s flexible, “portable” for any problem, and DOES get kids to read and understand the problem by 1) summarizing what they know and 2) asking a question for what they don’t yet know — two key comprehension strategies! How about: “Make a Plan for the Problem”? That’s the core of your rationale for using it, and I bet you’re already saying this all the time in class. Kids will get it even more because it’s a statement, not an acronym to remember. This is coming to my reading class tomorrow with word problems — thank you! Hi Nora! I have never thought about this as a reading strategy, genius! Please let me know how it goes. I would love to hear more! Hi! I am a middle school teacher in New York state and my district is “gung ho” on CUBES. I completely agree with you that kids are not really reading the problem when using CUBES and only circling and boxing stuff then “doing something” with it without regard for whether or not they are doing the right thing (just a shot in the dark!). I have adopted what I call a “no fear word problems” procedure because several of my students told me they are scared of word problems and I thought, “let’s take the scary out of it then by figuring out how to dissect it and attack it! 4. State the answer in a complete sentence. This procedure keep kids for “surfacely” reading and just trying something that doesn’t make sense with the context and implications of the word problem. I adapted some of it from Harvey Silver strategies (from Strategic Teacher) and incorporated the “Read-Draw-Write” component of the Eureka Math program. One thing that Harvey Silver says is, “Unlike other problems in math, word problems combine quantitative problem solving with inferential reading, and this combination can bring out the impulsive side in students.” (The Strategic Teacher, page 90, Silver, et al. ; 2007). I found that CUBES perpetuates the impulsive side of middle school students, especially when the math seems particularly difficult. 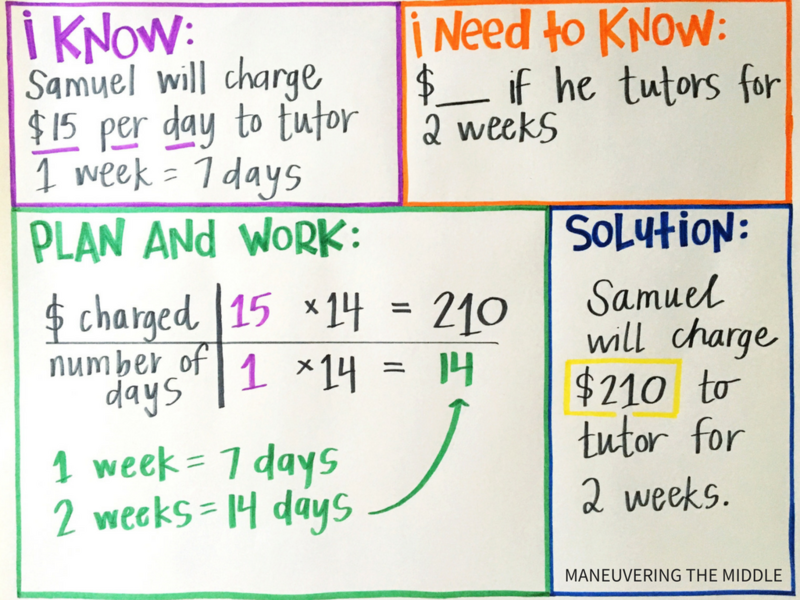 Math word problems are packed full of words and every word means something to about the intent and the mathematics in the problem, especially in middle school and high school. Reading has to be done both at the literal and inferential levels to actually correctly determine what needs to be done and execute the proper mathematics. So far this method is going really well with my students and they are experiencing higher levels of confidence and greater success in solving. Hi! Another teacher and I came up with a strategy we call RUBY a few years ago. We modeled this very closely after close reading strategies that are language arts department was using, but tailored it to math. I have anchor charts that we have made for classrooms and interactive notebooks if you would like them let me me know…. Great idea! Thanks so much for sharing with our readers! LOVE this idea! Will definitely use it this year! Thank you! I will definitely use this concept in my Pre-Algebra classes this year; I especially like the graphic organizer to help students organize their thought process in solving the problems too. I love the process you’ve come up with, and think it definitely balances the benefits of simplicity and thoroughness. At the risk of sounding nitpicky, I want to point out that the examples you provide are all ‘processes’ rather than strategies. For the most part, they are all based on the Polya’s, the Hungarian mathematician, 4-step approach to problem solving (Understand/Plan/Solve/Reflect). 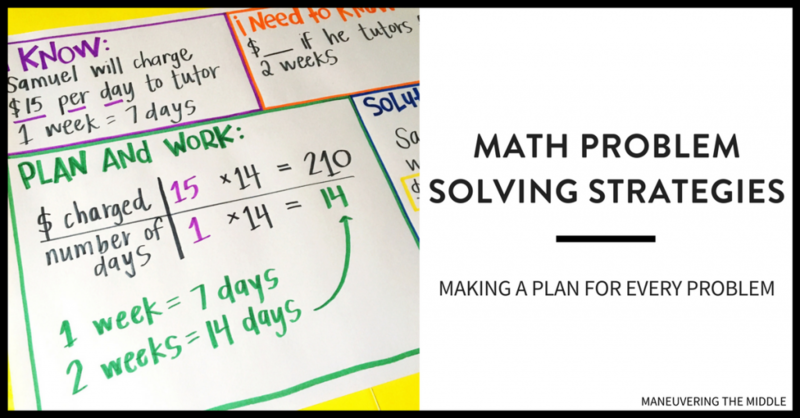 It’s a process because it defines the steps we take to approach any word problem without getting into the specific mathematical ‘strategy’ we will use to solve it. Step 2 of the process is where they choose the best strategy (guess and check, draw a picture, make a table, etc) for the given problem. We should start by teaching the strategies one at a time by choosing problems that fit that strategy. Eventually, once they have added multiple strategies to their toolkit, we can present them with problems and let them choose the right strategy. That’s brilliant! Thank you for sharing! Mrs. Brack is setting up her second Christmas tree. Her tree consists of 30% red and 70% gold ornaments. If there are 40 red ornaments, then how many ornaments are on the tree? What is the answer to this question? Whoops! I guess the answer would not result in a whole number (133.333…) Thanks for catching that error.